News and headlines such as these have kept Anand, a 38-year-old techie from Bengaluru, aware of his surroundings for a long time now. Since the time he rejuvenated his first lake, the enormity of the situation, and the need for someone to take action — became crystal clear for him. “Lakes are the eyes of the earth. They can see. They can monitor. They can tell us about the ecology of the region,” says Anand, who is all set to rejuvenate 45 lakes in the city by 2025. And he has already started the hard work, single-handedly. Once dotted with numerous beautiful water bodies that helped it earn the name, ‘city of lakes’, Bengaluru is now always in the headlines because of how a lake is frothing here, another lake is being encroached there, and the stench of yet another one is making life miserable for those living nearby. From 262 water bodies in Bengaluru in 1960, the figure has declined to 81, of which only 34 are currently alive. In a city bubbling with pollution, over-population, traffic, and dying lakes — Anand is a man on a mission. Someone who can talk about lakes, environment, and the power of one for hours on end and who has shown that if we as individuals get down to it, we can save this city and the environment at large. And we can start today! On February 15, 2019, The Better India published an article about Anand’s work. That single story about that single man’s initiative, opened the floodgates of responses from across the country and the world — of people and organisations who want to join him, who want to help, and who want to learn from him. Our own passionate interest in doing something for the environment led us to a meeting with Anand — one that led to the birth of Lake Revivers Collective. Inspired by all the amazing responses we received, we asked Anand if he would like to work with us and our readers towards achieving his goal. And without a blink of an eye, Anand said yes. 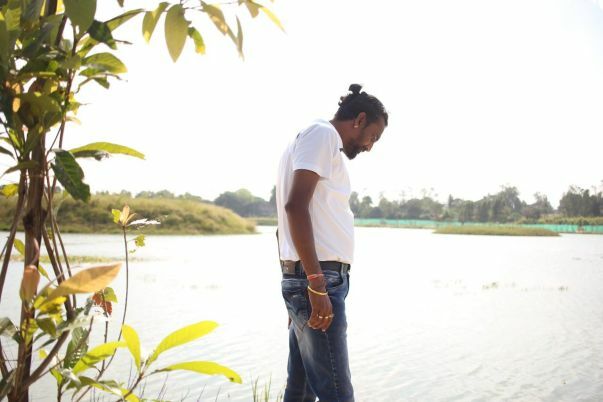 The Lake Revivers Collective is an initiative by which The Better India and its readers will help Anand reach his goal of saving Bengaluru, one lake at a time. 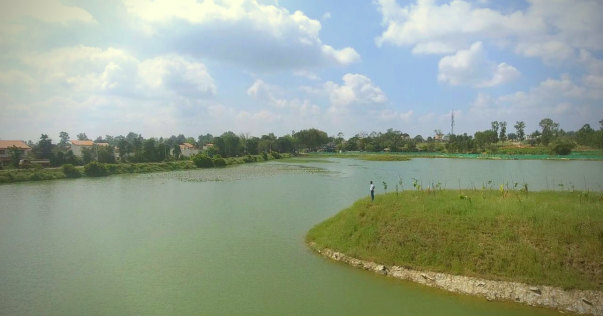 On World Water Day 2019, we are starting with Gavi Kere, a 3-acre lake in Anekal Taluk of Bengaluru South, which will be transformed into a model lake with the help of your contributions. 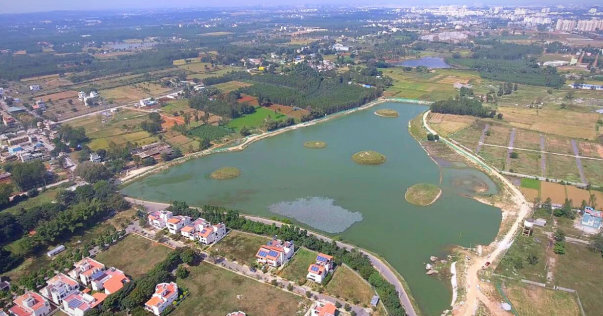 Speaking to The Better India, Anand shares details of a few recent successes that gave Bengaluru some of its prized lakes back. 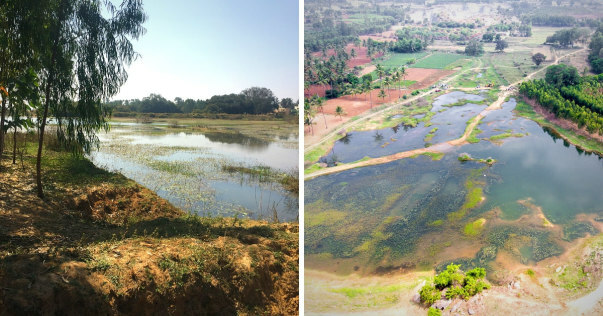 The first, he says, was the 36-acre water body, Kyalasanahalli Lake near Anekal, which was restored in only 45 days! Anand designed and executed the rehabilitation procedure with the help of nearby communities, including several techies from Electronic City. “We began the work on April 20, 2017, with a budget of Rs 1 crore and 17 lakh, provided by Sansera Foundation. We needed help and reached out to the nearby community with the help of a senior citizen, B Muthuraman (74). Together, we covered almost 400 houses to spread awareness. Eventually, people began to show up, and joined hands to work long hours to make this possible,” says Anand. He was Sansera’s CSR head at the time. Without the help of industry experts, architects or engineers, Anand, a mechanical engineer, along with fellow citizens, removed almost 4 lakh cubic meters of mud from the lake. This mud was then used to create five islands of 110 diameters each, all across the lake, in only ten days. These islands now serve as nesting areas for birds, with a huge tree planted in the middle for nests, as well as fruit-bearing and flower saplings around. “A total of 18,000 saplings, 3,000 fruit bearing trees of 22 varieties, 3,000 native species of plants, and 2,000 ayurvedic plants, now populate the lake area, providing it with a bounty of natural treasures,” he adds. The next step was to remove around 1 lakh cubic meter of mud from the lake and fill it with water. “When I first visited the spot, it was a disaster. Such a huge lake had dried up, and villagers were using it as a playground or dumping their waste. From that, we went on to create an oasis,” exclaims Anand. 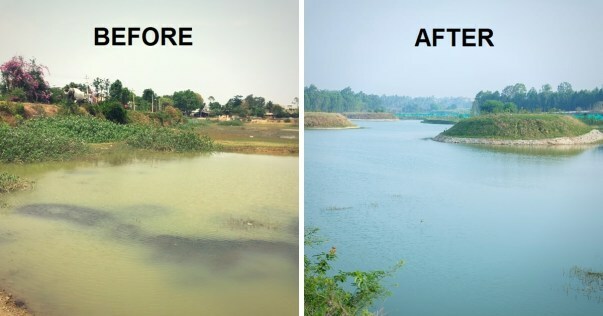 Two canals of the stormwater drain were diverted 1.8 km away, and then the September rains showered their magic, restoring life to a lake which had been dead for the past 35 years. The work eventually followed with the plantation of saplings and the creation of two Japanese Miyawaki forests on the lake. “It’s a unique procedure, and we created forests of almost 25,000 sq feet with more than 5,000 plants. 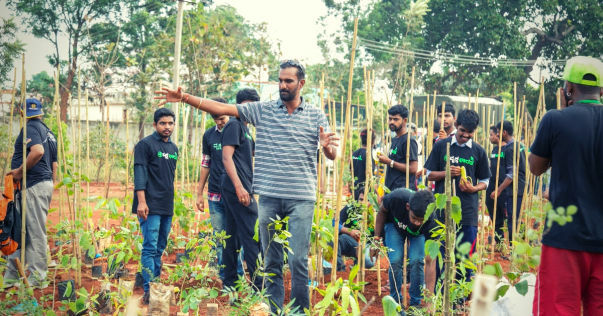 A total of 1,500 volunteers came together to plant trees in the forests in a record time of 1 hour and 45 minutes,” says Anand. He adds that the design was made keeping in mind the long-term aspects of sustainability. And so, the area surrounding the lake was not only protected by plants but also turfed with natural grass to save it from soil erosion. On June 5, 2017, the lake was entirely transformed, paving the way for Anand, a lake conservationist, to save the rest of the lakes, independently. 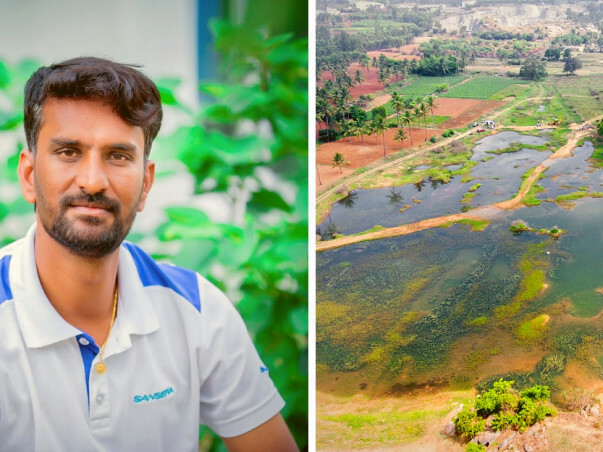 “After completing Kyalasanahalli Lake, I had found my calling, and so, I left my job, and began to work on other lakes, all on my own. The next stop was Vabasandra Lake near Bommasandra,” he says. 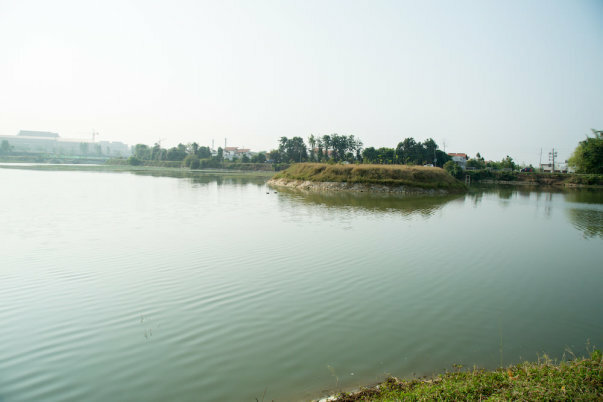 With funding to the tune of Rs 75 lakh from Hewlett-Packard (HP), he began the work on April 5, 2018, and in two months, the 9-acre area of the lake was transformed into a 50 ft deep water reservoir. Following this, the next target was 16-acres of Konasandra Lake. “It was in a situation worse than the foam-filled Bellandur lake when we found it. The pollution had changed the water to a toxic gel-like substance, making it one of the most poisonous lakes in the city. This was the doing of the industries and pharmaceutical companies in the area. But then, one of them, Hikal Ltd, decided to alter the damage and helped us with a fund of Rs 81 lakh to rejuvenate it,” Anand proudly says. This work began on November 3, 2018, and was completed on February 3, 2019. Rs. 8 Lakh: Desilting and Bund-Strengthening of the lake. Rs. 3 Lakh: Setting up of water inlet concrete pipes all around. Join The Lake Revivors Collective and help save Bengaluru, one lake at a time. Great initiative towards restoring the lost lakes of bangalore. This is a brave project and it will change many lives. We are cheering for you!